This is a plugin for WordPress that will add a widget for the Visual Verse of the Day from visualverse.thecreationspeaks.com. It dynamically grabs the latest image and verse reference. Install it from the plugin gallery – just search for “Visual Verse”. I continue to test it on the latest versions of WordPress. In the WordPress dashboard, go to Plugins > Add New. In the WordPress dashboard, go to Appearance > Widgets. 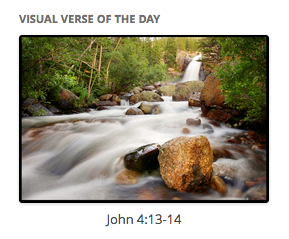 Find the new Visual Verse of the Day widget and click on it. Choose the desired widget area and click “Add Widget”. Find the list of widgets for that widget area and drag them into the desired order. If you don’t want the widget to be the full width of the widget area, click on the widget in the dashboard and set the width manually. You can use pixels or percent of the widget area. Are you saying that it actually said “blah blah blah” in the verse quotation? If so, I’ll let Pasquale (the author of the https://visualverse.thecreationspeaks.com/ site) know.